The holidays are once again upon us, with that of course comes parties! As a hot tub owner, you have the perfect place to host a great party, who doesn’t love a relaxing dip in the spa on a cold night, with snow lightly falling, surrounded by family and friends. Here are our 5 tips for hosting a holiday hot tub party to ensure you are prepared for the perfect hot tub party this holiday season. Make sure all your spa chemicals are in balance several hours prior to usage by the party guests. There would be nothing worse than having a guest become ill or end up with irritated skin due to a chemical imbalance in your spa water. Make sure the area around the hot tub is safe. That there it is clear of debris and anything that people might trip over and get hurt; also having a durable set of Spa Steps is a great idea. This will allow easier access in and out of the tub for all guests. If you will be having elderly guests or people who may need added assistance in entering or exiting the hot tub a spa handrail may also be a great idea. When hot tubing the main goal is to relax, and a key element to relaxation is ensuring comfort. Ensure that your spa pillows are in good condition and offering neck/head support for guests while in the tub. To maximize comfort for more petite guests have a hot tub booster seat available. As seats in many hot tubs seem to be built for people taller in stature, hot tubing can actually be uncomfortable for shorter bathers as it takes effort to keep themselves above the waterline and does not allow for maximum comfort, a booster seat is a great way to eliminate that problem and make sure they are very comfortable. Use spa aromatherapy to set the mood, using crystals combined with an elixir will give bathers all the benefits available such as: fragrance, water softeners, skin moisturizers, anti-inflammatory, and a natural remedy for aches and pains. For a Holiday party I would recommend scents such as White Musk Vanilla Jasmine or Eucalyptus Mint. Any holiday party would be incomplete without music and drinks. So set up your iPod speakers outside and crank up the holiday tunes for your guests to enjoy. With the weather being cold outside have a hot beverage available for guests to enjoy such as hot cocoa, cider, or eggnog. A Smart Bar or Spa Caddy on your spa can come in handy for holding those drinks also. 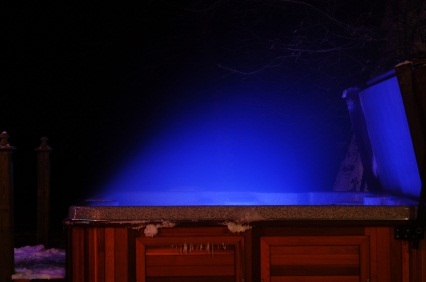 If you follow the tips outlined here you are on track for making your holiday hot tub party a great success, just remember the key elements of safety and comfort and your guests will have a marvelous time enjoying your spa with you.